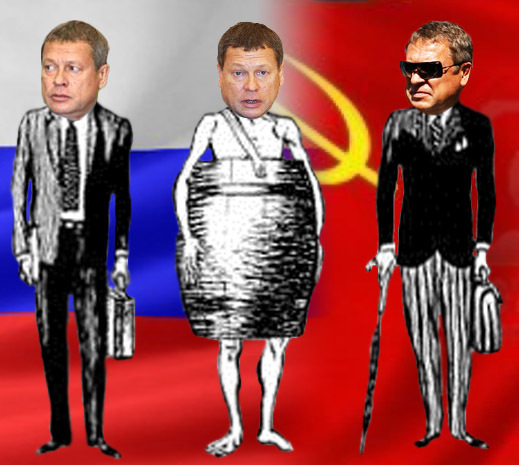 The sharp selloff of Mechel, the steel and coal group controlled by Igor Zyuzin, ought to demonstrate — if fresh proof were needed — that this is no longer a commercial operation in the normal sense of the term. Today Mechel is a nationalized enterprise kept solvent by five state banks in order to preserve the economies of several cities and regions across the country. The stock market gyrations this week, in which almost $330 million in market capitalization was liquidated, should also demonstrate – if that too were necessary – how little a Russian company listing on the New York Stock Exchange provides by way of accountable financial reporting or effective regulation by the US Securities and Exchange Commission (SEC). Mechel has failed to issue an official comment on the company website or notice to the SEC. Its spokesmen did send out tweets on the company’s social media pages claiming the abrupt sale of shares and bonds was “purely speculative”. Mechel has also done something no Russian company listed on a major international exchange has dared to do. It stopped issuing its quarterly financial results with its first or March quarter report, which appeared in mid-June. The next financial report has been postponed until December, when the quarterly results will be absorbed into single 9-month interval numbers. In the absence of company reporting on its debt restructuring negotiations with its banks, Mechel makes speculation inevitable that it is in default on its covenants, running out of cash, and running out of time. Instead of Mechel, several state bankers have announced that since they are in charge of Mechel’s debts and assets, the enterprise will continue to function stably. They almost managed to coordinate this reassurance among themselves, but for the Central Bank. It appears to have triggered the week’s stock market flurry by leaking the news that it had stopped accepting Mechel bonds as security in repo transactions. Since most of Mechel’s bonds, which were initially issued with state bank guarantees, are held by state banks, this was a curious case of one department of Gosplan* not knowing what the other department of Gosplan was doing , while separately they protected the month-end book value of their holdings. 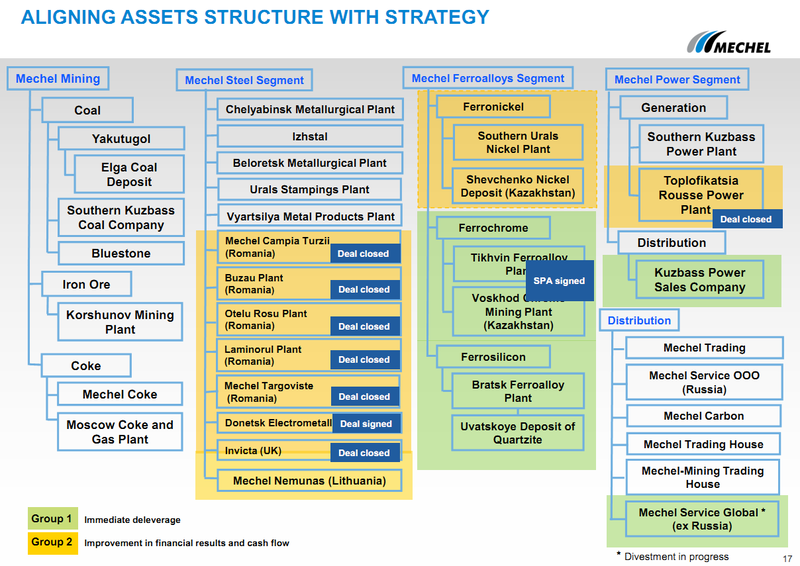 The five state bank lenders to Mechel are Sberbank, VTB, Gazprombank, Transcredit Bank, and Eurasia Development Bank. The following foreign banks are listed in Mechel’s Form 20F (SEC) filings: Unicredit, Raffeisen, ING, BNP Paribas, HSBC, Nordea, Société Générale, Morgan Stanley, Credit Suisse, Royal Bank of Scotland and Natixis. None of them will acknowledge their individual exposures except for Nordea. It claims it is no longer in a Mechel loan syndicate. 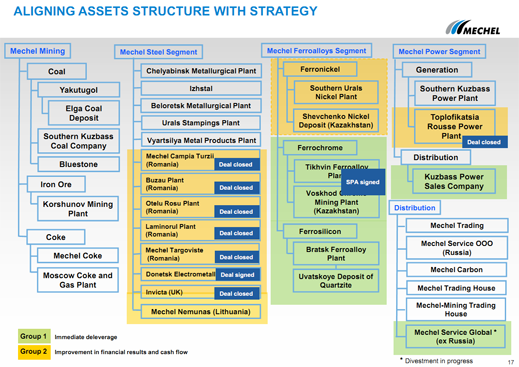 A Mechel presentation claims that 62% of its debt is held by Russian banks; another 22% of the debt is held by foreign banks, and 16% by bond holders (page 34). 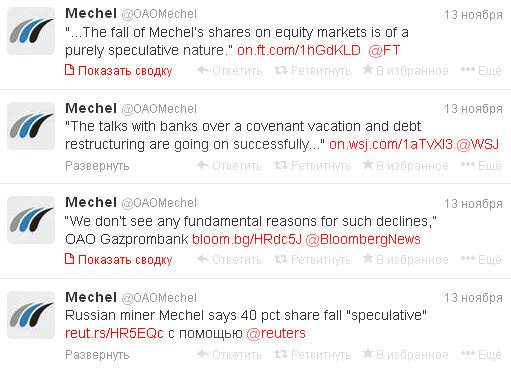 Current press reports suggest that VTB, Sberbank and Gazprombank hold 58 % of Mechel’s debt. The total gross debt Mechel reported as of March 31, 2013, was $9.3 billion. But cash on hand then was just $170 million (see page 7). That number wasn’t released until June 17. By then the company’s debt had grown to $9.5 billion and its cash position had deteriorated. According to the nine-month production and operations report, put out on November 7 but indicating tonnages not dollars, Mechel’s output of steel is down 28% compared to the same period of 2012; production of coal is down almost 2%. Sales of coking coal concentrate are down 8%; steam coal sales are flat; coke sales are down 15%; long steel product sales are down 12%; flat steel sales, down 12%; and billet sales down 67%. With prices for all of these products dropping in parallel with dwindling volumes, the contraction of the cash on Mechel’s balance-sheet is certain – and secret. Just one cryptic note in the latest operational report suggests that much of the cash generated for Mechel through its takeover of Vadim Varshavsky’s bankrupt steelmills has also dried up. For the Varshavsky story, read this. Mechel reveals that it can no longer book a healthy sales number for selling semi-finished steel to Varshavsky’s (aka Estar) mills: “Billet sales went down by 56% in the third quarter as sales of third-party products decreased due to the end of our strategic partnership with Estar Group’s enterprises.” Mechel has never disclosed the terms of that “strategic partnership”. For an analysis of how the state banks had taken over and effectively nationalized Mechel by April of this year, read this. The takeover is also reported to have transferred most of Zyuzin’s control shareholding of Mechel. According to the SEC records, Zyuzin’s stake in the group has been growing from 65.49% to 67.4%. In order to secure continuing bank credits, Zyuzin has pledged at least 43% of his shares, leaving him with a smaller minority than the free float; that’s currently reported at 32.6%. What happened over the long Moscow and New York Wednesday was that Mechel lost 23.3% of its market capitalization on the New York Stock Exchange, 41.4% on the Moscow Stock Exchange. The intra-day losses were even greater. At dawn on Thursday Mechel’s market capitalization was at an all-time low of $916 million. At the start of this year it had been worth $3.1 billion. This week’s abrupt fall in Mechel’s value is the largest since Zyuzin was verbally attacked by then Prime Minister Vladimir Putin in July of 2008; at the time Putin’s criticism was directed at the coking coal companies for hiking the price for domestic steelmakers well above what they were charging export buyers in Eastern Europe and East Asia. At that time, the immediate market reaction to Putin’s criticism left Mechel with a market value ten times the present one. What the trigger was for the Mechel share price collapse this week is uncertain. One version is that a rumour hit the Moscow market and morphed as it crossed the Atlantic. This suggested that Mechel was running into trouble finalizing its debt negotiations. Another version is that the rumour claimed that coal sale revenues would be hurt by cuts in exports to China. A third version is that one or two large shareholders had been obliged to sell shares or bonds because of margin calls. 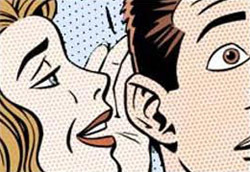 A fourth version is that the Central Bank was planning to drop Mechel’s bonds from its Lombard List, and that an insider leaked the news in advance to VTB, which dumped a large amount of Mechel paper as quickly as it could. The Lombard List is the inventory of creditworthy securities the Central Bank will accept in sale and repurchase (repo) transactions. Here is the Bank’s current Lombard List; nine Mechel issues remain listed. Ksenia Yudaeva, the first deputy chairman of the Bank, claimed yesterday that the Bank had been making “stress tests” on the Mechel bonds, for what she claimed was “a whole complex of reasons”. These were influencing a proposal by the Bank to suspend the creditworthiness of the bonds. But Yudaeva refused to clarify the reasons for the stress testing, and she refused to say whether the Mechel issues are about to be delisted from the Bank’s Lombard List or not. Instead, she claimed that it will be up to the next board of directors meeting of the Bank to decide whether to drop the Mechel bonds. She also claimed that in practice, Mechel’s bonds have rarely been used as collateral in the Bank’s operations. Between this position and the next board meeting, according to Yudaeva, the Bank has taken no delisting action. According to Bank releases that meeting is scheduled for December 13. An agenda for the meeting was issued publicly on November 8. Another of Mechel’s state creditors, Gazprombank, has issued a statement that the debt negotiations are running on schedule and “in a positive direction”. VTB was asked to say what progress it can report from the debt negotiations with Mechel, and to clarify whether it had sold Mechel bonds early in the week, as the Moscow press have been reporting. VTB’s spokesman refused to answer. [*] Gosplan, or the State Planning Committee, Государственный комитет по планированию, officially ceased to operate on April 1, 1991.